Stores a time history of messages. Given a stream of messages, the most recent N messages are cached in a ring buffer, from which time intervals of the cache can then be retrieved by the client. 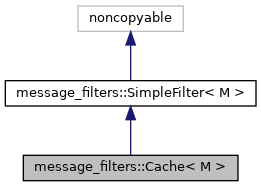 Cache immediately passes messages through to its output connections. Cache's input and output connections are both of the same signature as roscpp subscription callbacks, ie. Definition at line 66 of file cache.h. Definition at line 70 of file cache.h. Definition at line 69 of file cache.h. Definition at line 73 of file cache.h. Definition at line 84 of file cache.h. Definition at line 95 of file cache.h. Add a message to the cache, and pop off any elements that are too old. This method is registered with a data provider when connectTo is called. Definition at line 119 of file cache.h. Definition at line 128 of file cache.h. Definition at line 328 of file cache.h. Definition at line 90 of file cache.h. Grab the oldest element that occurs right after the specified time. Definition at line 267 of file cache.h. Grab the newest element that occurs right before the specified time. Definition at line 239 of file cache.h. Receive a vector of messages that occur between a start and end time (inclusive). This call is non-blocking, and only aggregates messages it has already received. It will not wait for messages have not yet been received, but occur in the interval. Definition at line 166 of file cache.h. Returns the timestamp associated with the newest packet cache. Definition at line 295 of file cache.h. Returns the timestamp associated with the oldest packet cache. Definition at line 312 of file cache.h. Retrieve the smallest interval of messages that surrounds an interval from start to end. Definition at line 205 of file cache.h. Set the size of the cache. Definition at line 104 of file cache.h. Definition at line 334 of file cache.h. Definition at line 333 of file cache.h. Maximum number of elements allowed in the cache. Definition at line 335 of file cache.h. Definition at line 337 of file cache.h.